1.7.1 Do You Like This Article? As far as I can remember growing up in the Caucasus Mountains of the Republic of Georgia, pomegranates had a special place on our table. Every time I look at a pomegranate, I remember in childhood when we used to climb trees to pull off this beautiful bright, red colored fruit. I’m very excited to introduce the benefits of pomegranate to all my readers. Pomegranate, a fruit known to people since the beginning of time, has unique and useful properties. It’s considered to be the “king among all fruits” in the East. 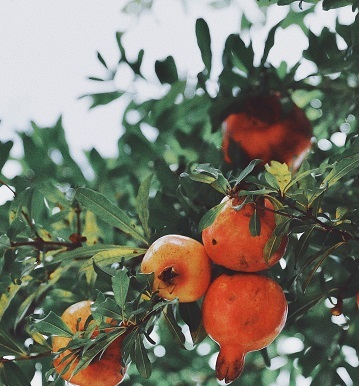 The pomegranate tree is native stretching from Iran to the Himalayas in northern India. The fruit had been cultivated since ancient times throughout the Mediterranean region of Asia, Africa, and Europe. It was utilized in many ways and was featured in Egyptian mythology and art, praised in the Old Testament of the Bible and in the Babylonian Talmud and was carried by desert caravans for its thirst-quenching juice. The tree was introduced to California by Spanish settlers in 1769. It is grown for its fruit mostly in the dry zones of that state and Arizona. Pomegranate is the fruit of the pomegranate tree, and covered within the dark red, dense crust inside are bright, burgundy juicy berry seeds. Buying pomegranates, it is necessary to pay attention that the ripe fruit should be firm, the peel a little dried and slightly tight. Pomegranate is used not only fresh, but it is also used for baking, cooking, juice blends, meal garnishes, salads, cold and hot dishes, sweets, drinks, and wines. The peel, bones, and flesh of pomegranate, as well as flowers and bark of pomegranate tree, are used for the preparation of various drugs. Pomegranate contains vitamins C, E, P, group B (B6, B12), minerals such as potassium, calcium, magnesium, manganese, iodine, iron, silicon, phosphorus, sodium, and other macro and microelements. Pomegranate is composed of sugar (fructose, glucose), organic acids (citric, malic, succinic, tartaric, oxalic and others), volatile, tannins and nitrogenous compounds. Pomegranate is superior to red wine and green tea in antioxidant content. Pomegranate contains essential amino acids, some of which, in addition to pomegranate only found in meat. Therefore, experts recommend regularly include this fruit in the diet of vegetarians. One medium fruit contains about 235 calories. The majority of the calories come from carbohydrates. This fruit contains 11 grams of fiber and 39 grams of sugar and it provides about 50% of your daily Vitamin C norm and about 60% of your vitamin K norm. You’ll also get a healthy boost of fiber when you consume pomegranate. Most of us don’t get enough fiber in our diets each day. Fiber helps to boost satiety, improves digestive health, and may help to lower blood cholesterol. Pomegranate has a long history of medicinal use. Because of the pomegranates ability to fight bacteria, Greeks and Romans used the seeds to make oral contraceptives and vaginal suppositories. In the Middle East and Asia, people used bark, fruit, root and the rind of pomegranate for medical purposes. Regular use of pomegranates has a beneficial effect on almost all human organs and systems. Therefore, people who care about their health and lead a healthy lifestyle, it is necessary to include this wonderful fruit in their diet. Pomegranates are a wonderful tool to strengthen the immune system. It helps to cope with colds, has anti-inflammatory effects. It has a restorative effect, it is recommended for exhaustion, after surgery and serious diseases. Pomegranate may help in the treatment of cancer. Experts recommend using pomegranates and pomegranate juice to people who have received radiation, as well as working or living in areas of high radiation. It has a positive effect on the cardiovascular system, strengthens the walls of blood vessels, is a good prevention of atherosclerosis, reduces swelling, it is recommended for various diseases of the heart and blood vessels. Pomegranate and pomegranate juice improve the composition of blood, dilute it, increase the level of hemoglobin, improve blood circulation, which accordingly has a positive effect on all human organs and systems. Regular use of pomegranates helps to gradually reduce blood pressure, so it is recommended for people suffering from hypertension. Pomegranate strengthens the nervous system, helps fight stress and depression. Juice from this fruit has a good effect on vision, helps to improve the adaptation of the eye to the dark, protects against cataracts. Pomegranate reduces the risk of oral diseases, in folk medicine is used to treat Stomatitis. It has a beneficial effect on the joints, slows down the wear of cartilage. Regular use of pomegranate has a good effect on human skin, and its external use helps to get rid of age spots, freckles, and acne. Pomegranate is useful for men who suffer from impotence. The fruits of ripe pomegranate, containing a lot of vitamin B12, makes the blood circulate better, which is a necessity for men’s erectile function. Pomegranate helps relieve the symptoms of menopause in women thanks to estrogens, which are contained in the pomegranate as well as prevent depression. Ellagitannin is another substance, which is contained in this fruit in large quantity, can help prevent breast cancer and the growth of cancer cells. Pomegranate is good for children. Diluted pomegranate juice is given to children with anemia (a common disease in children), as it contains ascorbic acid helps to absorb iron from products such as liver and meat. There are no known safety issues with drinking pomegranate juice or eating the fruit, however, some people can have allergic reactions to pomegranate fruit. Pomegranate extract is possibly safe but some may experience sensitivity to extract. Pomegranate is POSSIBLY UNSAFE when the root, stem, or peel are taken by mouth in large amounts. The root, stem, and peels have been known to have poisons. Drinking pomegranate juice can slightly lower blood pressure. Drinking pomegranate juice might increase the risk of blood pressure dropping too low in people who already have low blood pressure. Allergies to plants: People with plant allergies seem to be more likely to have an allergic reaction to pomegranate. Surgery: Pomegranate might affect blood pressure. This might interfere with blood pressure control during and after surgery. Stop taking pomegranate at least 2 weeks before a scheduled surgery. To learn more about the side effects of pomegranate click here. There are so many ways you can include this wonderful fruit into your diet. 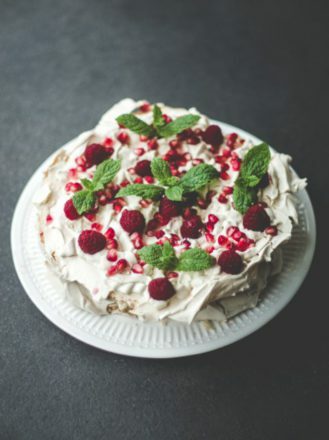 In Georgia, for example, we put pomegranate arils on our salads and sprinkle them on all our appetizers, we also add arils on our baked goods and cakes and make juices and wine out of pomegranate fruit. It should be slightly square in shape, which means the arils inside are pressing against the outer walls of the fruit and are nice and juicy. The skin of a ripe pomegranate should be a bright or dark red. The darker and deeper the color, the sweeter your fruit will be. Look at the top of the fruit. If the little petal-shaped appendages at the top are turned slightly inward, your pomegranate is ripe and ready to eat. Rub your finger over the surface of the pomegranate. The skin should be smooth and tight. Add your pomegranate to your morning cereal so it won’t be so boring. You can use pomegranate arils on your yogurt for added flavor and boost your fiber intake. Drink freshly squeezed pomegranate juice, smoothie or added to your tea for added color and nutrition. Juice the fruit with seeds and make your own dipping sauce with some spices for your meat, chicken or fish dishes. Toss them into your green salad. Make a fruit salad and add a generous amount of pomegranate. 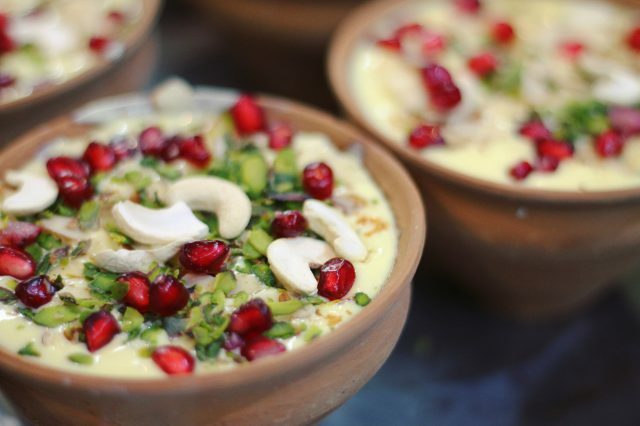 Sprinkle pomegranate arils to your pancakes, desserts, and puddings. Make a cucumber salad and add pomegranate, it goes very well with each other. Pomegranate is delicious when paired any cheese you like. Serve a cheese tray with pomegranates, apple slices, grapes, and figs. Serve your guacamole dish with some pomegranate. Fresh pomegranate juice has a sweet and sour taste with astringent notes. We will focus only on fresh pomegranate juice, and not the store bought because of added sugars and preservatives. Amino acids are a necessary component for the functioning of our body. Pomegranate juice has 15 kinds of them, which makes it one of the most useful and rich sources of amino acids for humans. One of the main properties of the juice is the cleansing of the body. Thanks to tons of antioxidants in pomegranate it is great for detoxification of the body. It also helps to normalize gastric activity and has a positive effect on appetite and hemoglobin. Great help with respiratory infections, cough, sore throat, gastrointestinal disorders. It has a diuretic and antiseptic effect as well. During the opening of the Egyptian pyramids, archaeologists discovered that the deceased rulers were berried with pomegranates. This fruit was considered sacred and able to give a new life. And the pomegranate tree was called the tree of life. Mention of the fruits of the pomegranate tree is in the Koran. The first mention is that the pomegranate tree grew in Paradise. The second is that the prophet Muhammad advised his followers to use the fruits of pomegranates as a means against envy and hatred. Pomegranate syrup is used in a variety of alcoholic beverages as a sweetener and natural dye. One of the most popular cocktails “Tequila sunrise”: 45 ml of tequila, 15 ml of grenadine, 90 ml of orange juice. Pomegranate contains 15 amino acids, 5 of them are essential. In addition, pomegranate is rich in vitamins C, A, b, PP and potassium. And in 100 grams of pomegranate contains only 70 calories, so it is ideal for people who are watching their weight. Conventional pomegranate has a maximum diameter of 7 inches and contains up to 700 seeds covered with a juicy shell. And in the province of Sichuan in China managed to grow pomegranates, the diameter of the fruit of which was 19 inches. this is by far the largest pomegranate, and it is listed in the “Guinness book of records”. Pomegranates grow on low trees or bushes strewn with scarlet flowers. Yield per tree is about 136 lb. The weapon was called “grenade” because of its resemblance to the fruit-grains and flying grenade fragments. Pomegranate has the ability to increase hemoglobin. Therefore, it is prescribed during anemia. Diluted with water pomegranate juice should be consumed 0.5 cups 3 times a day for 30 minutes before meals for 2 months. Pomegranate is not for people with gastric ulcer and gastritis, because it contains malic and citric acids, which violate the acid-alkaline balance. Almost the whole year the pomegranate tree is covered with fruits. This is due to the long period of maturation. From summer to autumn the tree blooms, but most of the flowers are completely barren. The fruits also ripen for a long time – 120-160 days. To make only 34 ounces of pomegranate oil you need 1102 lb of fruit. The oil has unique cosmetic properties. It stimulates collagen production and skin regeneration. In addition, due to the content of vitamin E and antioxidants, it is used to treat eczema and psoriasis. In Armenia, there is a tradition for girls who get married: before the wedding, they throw pomegranates against the wall to find out how many children they will have. And in China, there is a tradition to give a picture of a pomegranate to a wedding. The fruit symbolizes well-being. Pomegranate slows down genes that contribute to the development of atherosclerosis and at the same time stimulates a useful gene that regulates the production of nitric oxide. This protects the vessels from atherosclerotic plaques, preventing the development of heart attacks and strokes. Pomegranate juice is sold in Turkish coffee houses as the strongest aphrodisiac. American researchers from the University of Ohio found that pomegranate is able to prevent the development of breast cancer. The pomegranate contains nutrients that block the excessive synthesis of estrogen, which provokes cancer. Eat pomegranates and other healthy foods with pleasure! If you love pomegranates, leave a comment and tell us how it benefited you! This is such a great article for so many reasons. I love reading about the origin of the fruit and how people across the world enjoy it everyday, as we do here. Pomegranates can be prepared or eaten in so many ways and I never thought about using them beyond juices and eating the seeds raw. The health benefits are simply outstanding and I never knew this fruit can help out in so many ways! Will definitely be eating more pomegranates from now on! Thanks Elen for reading my blog. I hope it was helpful and interesting. Wow, these are powerhouses of nutrition! I never realized just how nutritious pomegranates are! I run a healthy website, and I am going to have to do a feature article on these little gems. They are delicious, too, but a little crazy looking, right? LOL. I like the “love potion” part – I’ll have to feed some to my husband. I love the cleansing feature, too. So it looks like I am going to be consuming more pomegranate in the future. Thank You very much for your comments. I love pomegranates and always have them in my kitchen. My parents use to give us fresh squeezed juice and tell us its good for your blood.Now I understand why. It elevates your hemoglobin levels. And it’s healthy for many other reasons. Thanks again and tune for more articles. All the best to you and your family. I love pomegranates, one of my favorite fruits. Actually, I eat it to keep my immune system strong. For me, it helps to keep colds and flu at bay. Whenever I can’t get the whole fruit, I buy the bottled juice sometimes. It is very sweet though, so I dilute it. Thank You for reading my blog. I’m glad that you are familiar with this magnificent fruit. It is one my favorites too.I hope you found some facts in my blog that was helpful for you. I suggest to use fresh squeezed pomegranate because store bought is usually packed with added sugar. Wow, amazing post! I have not purchased pomegranates for years because I did not know how and always ended up with a not so great fruit. 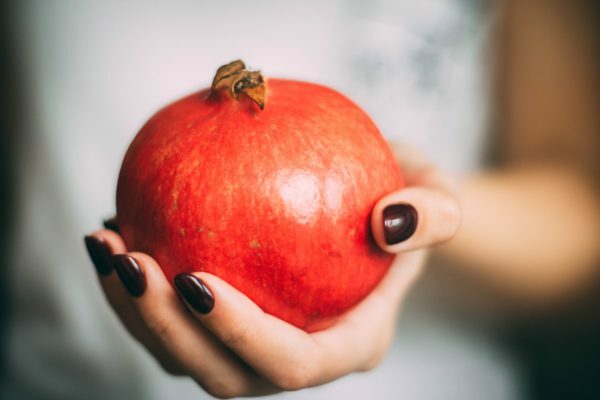 Thank you for sharing all the great properties of this fruit, as well as a lot of information, because I had no idea pomegranates were diuretics, or any of the other great info that you provided. Is there a “best” time of year to buy pomegranates? Irma,Thanks for reading my article. Usually the best time to buy is fall. Harvest season for pomegranates is September for early ripening varieties and continues through October.